Can Rabbits Have Apple Skin? If you have ever spent some time with a rabbit, you know one of the sweetest moments is watching them munch on all sorts of hay and roughage. These herbivores love to munch, but their diet consists mainly of hay with some dried vegetables. So what about fruit? They certainly would come across some in the wild! You may have even seen them eat some apples, but is the whole apple ok for a rabbit to munch on? What about the skin? Many times when it comes to feeding our pets it may be ok to feed them certain parts of fruits and veggies, while others are better to forego. For example, rabbits can eat the meat part of a melon, but you should throw the seeds and rind to the side. Is the same true for apples? Answer: Yes! 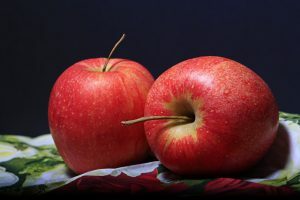 In fact, the skin of the apple is where you will find most of the nutrients in apples. It is the stem and the seeds that can be toxic for rabbits. You should also be sure to thoroughly wash apples before feeding them to any bunnies. Apples are frequently sprayed with pesticides, which can be harmful to their little bodies. Wash well, then feed in small amounts. If you are going to give your rabbit any amount of apple, you should definitely include the skin! The skin is where they will receive most of the health benefits. In the skin, you will find vitamin A, C, fiber, and antioxidants. While your rabbit probably gets all of their essential nutrients from their rabbit food, these are all great nutrients that can help keep your rabbit happy and healthy. Even though the apple skin may be the most beneficial part for your rabbit, know that eating too much apple can upset your rabbit’s sensitive stomach. Since rabbits stomachs can be tender, the acidity in apples can upset them if they consume too much acidity. Only give them small amounts of apple as a special treat from time to time. Consider the acidity of other treats you give your pet, in order to not overdo the treats and upset their stomach. These benefits may not extend to baby rabbits since they are still developing their digestive system. Avoid giving these potentially harsh foods to your baby rabbit until they are old enough to start consuming these treats. This will most likely be when they stop consuming their mother’s milk and switch to traditional rabbit food. Whenever you introduce a new food to your rabbit, begin by introducing one food item at a time. This way you can monitor how their system is able to handle each new food. Also, introduce the new item in small quantities then monitor any changes in habit. For example, does your rabbit become lethargic or do their stools appear looser? If it is a result of the new food in their diet, it may be a good idea to not reintroduce that item. The acidity in a rabbit’s stomach is not the only thing you need to worry about. Apples are also high in sugar which means too much can affect a rabbits weight, teeth, and digestion. Again, this is why apples should remain a treat and can be true for other fruits as well. If you are introducing any fruit to your rabbit’s diet, consider the quantity you are giving and the amount of sugar these fruits contain. Fruit is a great treat for rabbits, but consider bunnies in the wild. Fruits will be a rare treat and only during certain times of the year. So if fruit is a frequent part of your rabbit’s diet, it may have harmful effects on their digestion, teeth, and weight. If you do want to give your rabbit treat apples are a great option, but there are others as well! Take peaches, berries, turnips, or papaya for example. This can help reduce the amount of acid consumed while still providing your pet with a fulfilling snack. Lastly, if you do decide to feed your rabbit apples, only give them the meat and skin. The seeds and stems contain cyanogenic glycosides which are poisonous to rabbits. If consumed it can upset your rabbit’s stomach, slow their heart rate, and cause diarrhea and vomiting. In some cases, it can even lead to death. Apples are a nutritious fruit that can be a sweet treat rabbits will just love, this is especially true for the apple skin! Be sure to clear out your apple of stems and seeds. Give them a good wash too before giving bites to your furry friend. Failing to do any of these may be toxic for your pet. Can Dogs Drink Coconut Water? Can Rabbits Eat Brussel Sprouts?